Sky Raider - Sold Out! Hyland Park II - Sold Out! Rose Place - Sold Out! Rainbow Run - Sold Out! Alder Grove Estates - Sold Out! Sky Raider – Sold Out! Imagine coming home to serenity and comfort. Uncover acres of inviting natural locales at Sky Raider. 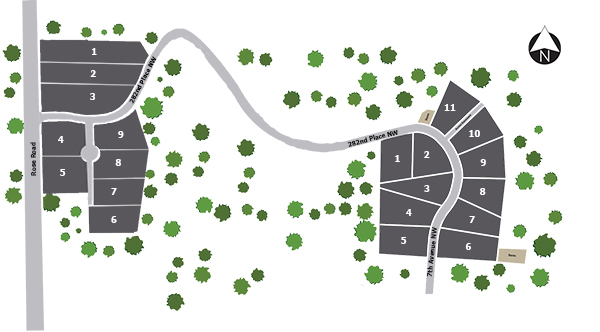 Each home is nestled on its own one acre wooded site. Discover beauty inside and out via these homes superb interior finishes and charming territorial views. Multiple floor plans available, varied from 3-4 bedrooms. Distinctive designs include flexible spaces to work within your own personal needs. Master Suites include 5 fixture master baths. Elegant finishes, gorgeous cabinetry and stainless appliances are just some of the fine details put into these homes. Minutes from shopping and I-5.